Prior Maborel is a Breton priest living at Weynon Priory. He sleeps upstairs in Weynon House between midnight and 6am. As soon as he wakes up, he walks over to the chapel and wanders around inside until midday, when he returns to the house. He seats himself at the table next to the stairs on the ground level and stays there until bedtime. This routine ends with the Weynon Priory quest, during which he will fight hard to protect the priory, but ultimately end up losing his life at the hands of the Mythic Dawn. He wears a rare weightless black robe, a gold ring and a pair of green velvet shoes. He carries only a small amount of gold. Prior Maborel has the ability to use a leveled set of priest spells and one extra major Restoration spell. When you approach him for the first time, he will politely introduce the Priory and himself: "Welcome to Weynon Priory, a monastic retreat dedicated to Talos and the Nine Divines. I'm Prior Maborel, head of our community, and responsible for all our religious and secular affairs." 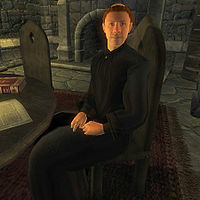 If you ask him about Weynon Priory, before having spoken to Jauffre, he will introduce the Priory and his stance on the Emperor's assassination: "The priory is a chapterhouse of the Order of Talos. And with the last Septim emperor dead, and all his heirs... Tiber Septim is the god and patron saint of our order. And now his dynasty has come to an end. It's very painful. I was just here reading the Black Horse Courier about the assassination, and looking through 'A Short Life'. Uriel was an old man... a good man, and a good emperor. Why would anyone want to kill him? And all his sons?" If you have spoken to Jauffre beforehand, he will be friendlier and give you a different introduction to the Priory and its inhabitants: "Weynon Priory is a monastery devoted to the praise and worship of Talos and the Nine Divines. Brother Piner, Father Jauffre, and I are members of the Order of Talos. Eronor, a lay brother, tends after the sheep and our little farm." When asked, he will elaborate on the Order of Talos; "Our order works to spread the teachings and worship of the divine Talos. Surely you have heard of us? If not, I invite you to spend some time in our fine library. All are welcome here." He will also provide some information on the Blades: "The Emperor's elite knights. They dedicate themselves to Talos above and the Septims here on earth. The loss of the Emperor must be a terrible blow to them." Finally, he will prove most helpful when asked about assistance: "You are welcome to take my horse. I rarely travel, so I'm sure you will put her to better use than I." If you have already talked to Jauffre about assistance, he will rephrase his offer slightly: "I know that you are on an important mission for the Blades. Please, if you need a horse, take mine from the Priory stables." When you return to the Priory with Martin by your side, the small monastery has been invaded by Mythic Dawn agents and Prior Maborel will already be dead, lying in a pool of his own blood near the entrance to the Weynon House. A panicking Eronor will tell you what happened: "Prior Maborel is dead! I was in the sheepfold when they attacked. I heard the Prior talking to someone. Looked around the corner to see who it was. They looked like travellers, ordinary. Suddenly weapons appeared in their hands and they cut the Prior down before he could even move!" After the attack, Brother Piner will mourn over his dead friend: "Poor Prior Maborel. He was dead when I came outside. Who could have done this?" Even if he dies before the Mythic Dawn invasion on the priory, Eronor will still claim to have seen Maborel killed by the agents, and his body will be moved from wherever he died. Without talking to Jauffre about "Assistance," it is possible for Prior Maborel to offer you his horse, but when you try to take the horse, it will still have a red icon. This can be solved by talking to Jauffre about "assistance". This page was last modified on 17 August 2018, at 12:47.